An automatic fire sprinkler system is one of the most valuable system you can install in your home to further prevent the damaging effects of a fire. Automatic fire sprinkler systems set off when the effects of a fire have been detected, such as when a predetermined temperature has been reached. This temperature triggers the alarm check valve and disposes water to areas where there is heat and fire. A lot of people think that sprinkler systems will set off with a simple smoke problem in the home and foreseeing water damage inside their house even if there isn’t really a fire. Fire sprinklers do not release water just because of a simple food item burning in the oven. It will usually set of a fire alarm if smoke gets too thick but pressure from heat produced by a growing flame will eventually set this sprinkler. Automatic fire sprinkler has its advantages. The system does not only warn the residents of a home of an occurring fire but also responds quickly to extinguish a fire even if there is no one to set the system. Fire sprinklers will not completely cause water damage to the whole house because the fire itself would activate sprinkler heads individually and not as a whole. For example, fire starts in the kitchen. 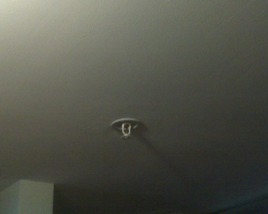 Only sprinkler heads in the kitchen will turn on killing the fire at its early stages. People think that just because one sprinkler head gets activated, all the sprinkler head will also get activated—not true at all. Smoke without the presence of heat will not activate a sprinkler system. Fire that causes heat should be present and the temperature most often associated to its discharge would have to be 160 degrees Fahrenheit. But keep in mind that there will come a time that without fire, the temperature can get this high especially in enclosed, deep spaces like underground basements. When fire gets high like that, sprinklers will set off since this will already indicate a possible bigger fire somewhere. Automatic fire sprinklers will consume less water that having the fire department put off a fire because these systems tackle fire at its earliest stages before it becomes full grown therefore lessening possible damage the fire will consume and less water damage to property since the fire department will most likely try to water down the whole house because it is often hard to predict where the fire has started form the outside view. Lastly, areas protected by automatic sprinkler systems can be re-occupied within a few hours after the supposedly fire damage. Automatic fire sprinkler systems can be a life saver so make sure you have one installed in your home or business. Nowadays, fire sprinkler systems are becoming more and more affordable so why risk of not having one installed? Remember, this will prevent damaging effects of fire and should always be taken into consideration.